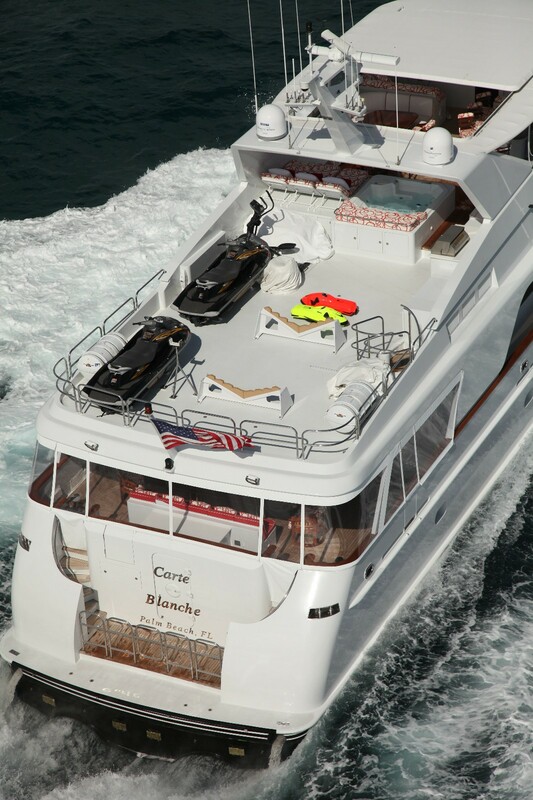 Motor yacht CARTE BLANCHE is a 37 m (124 ft) luxury motor yacht built by Trinity yachts in 2002. 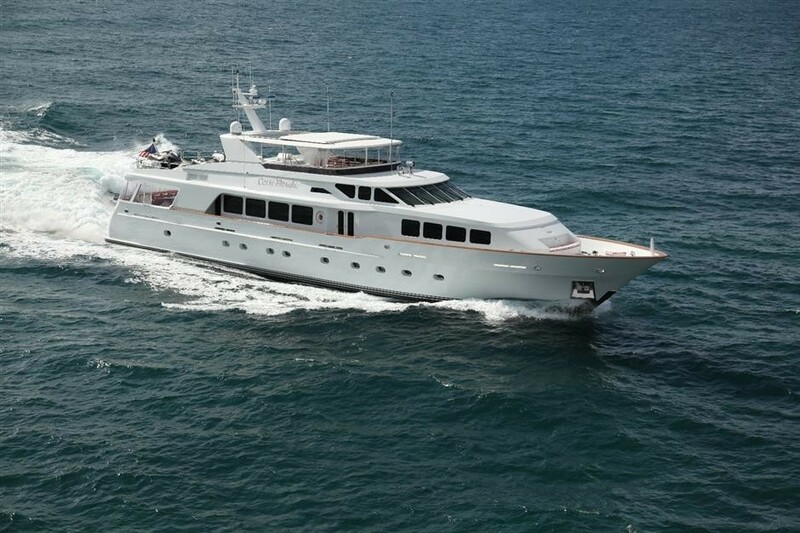 She has an aluminium semi-displacement hull and can cruise at up to 15 knots. 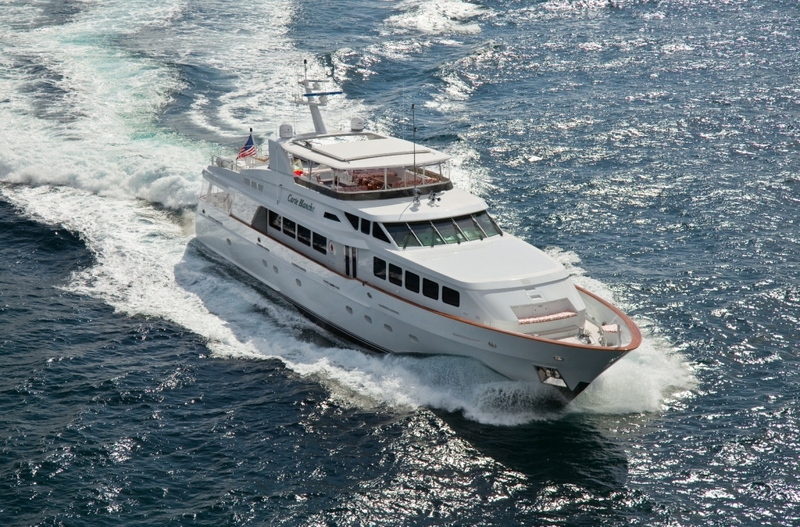 With five spacious cabins, she offers comfortable accommodation for 10 to 11 guests who are pampered by five professional crew whilst cruising the fabulous waters of Florida and the Bahamas. Motor yacht CARTE BLANCHE (ex Wheels) has been uniquely designed to replicate the essence of a 1940’s cruise ship. 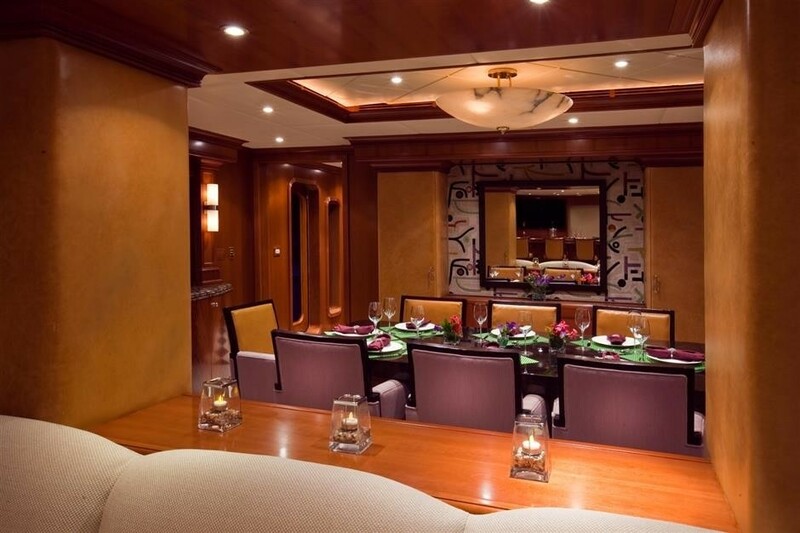 Her elegant interior decor was designed by Dee Robinson and combines warm earthy tones with a rich but matt finished cherry-wood panelling. 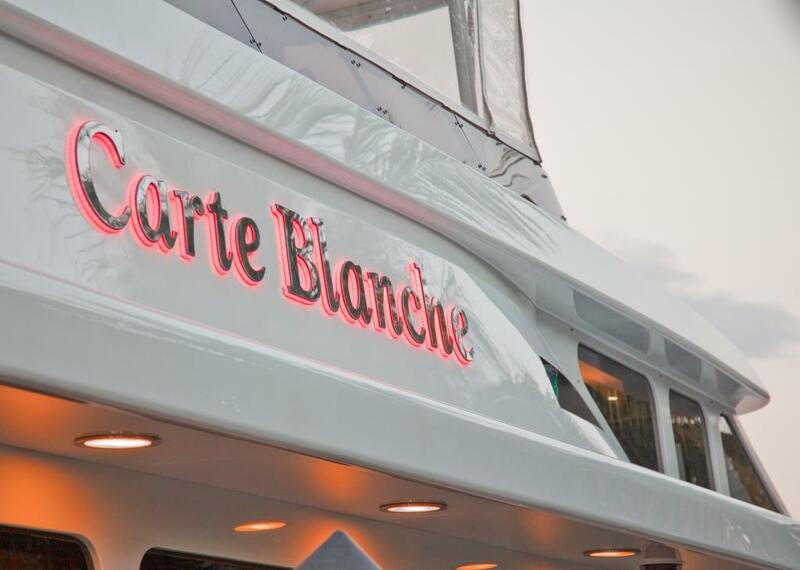 Motor yacht CARTE BLANCHE (ex Wheels) has an atmosphere of refined elegance created by the use of unique materials and textures. 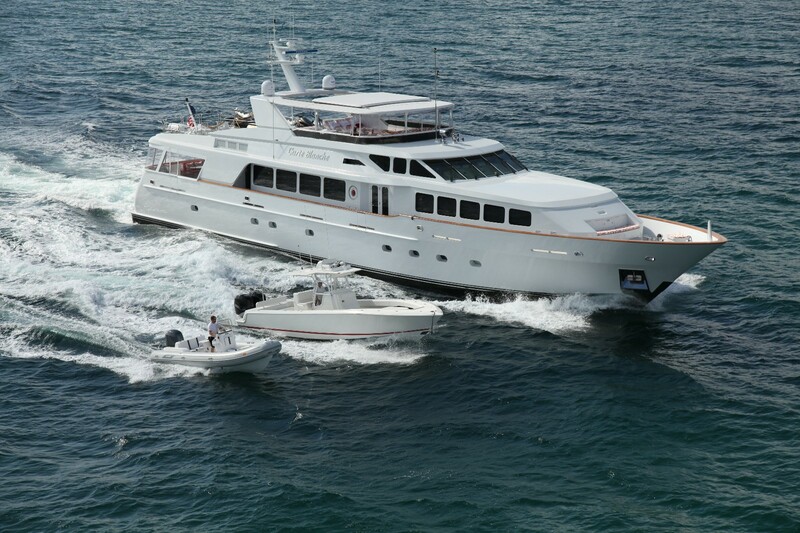 She has an open style design and feeling. 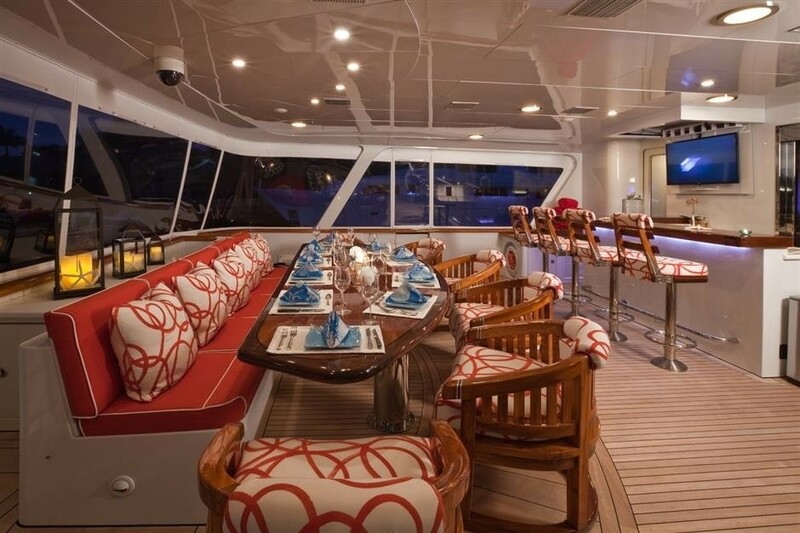 Aft, a games table continues onto comfortable lounges with entertainment facilities and further into the dining area which is separated only by cabinetry. 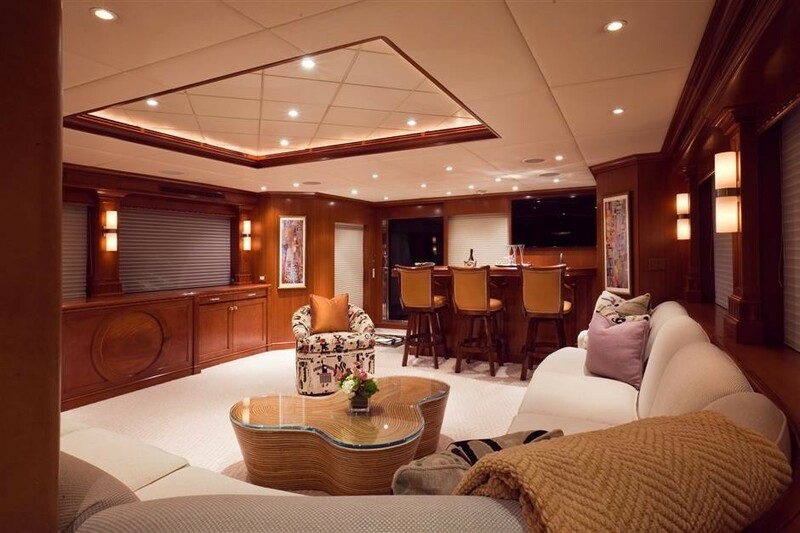 The open style salon creates an ambiance of openness and freedom inside as natural lights also floods the room through large windows along each length of the hull. 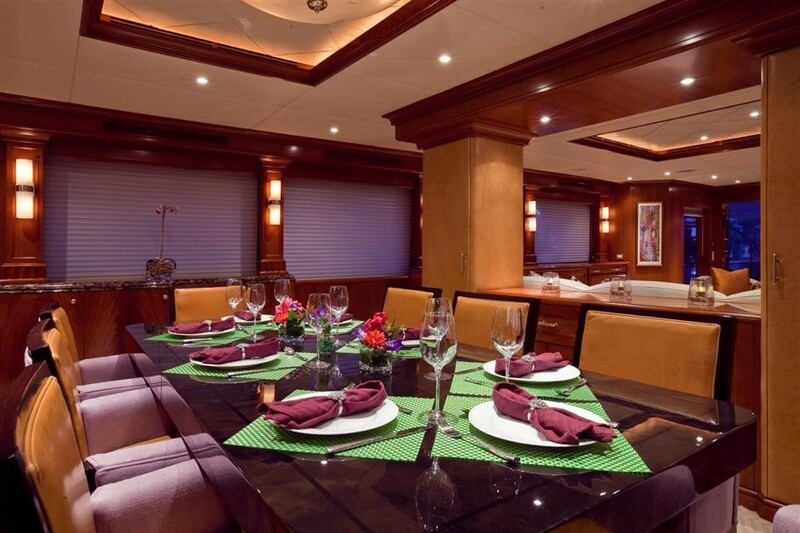 Forward on the main deck is the VIP Stateroom which also benefits from plenty of natural lights through large windows. 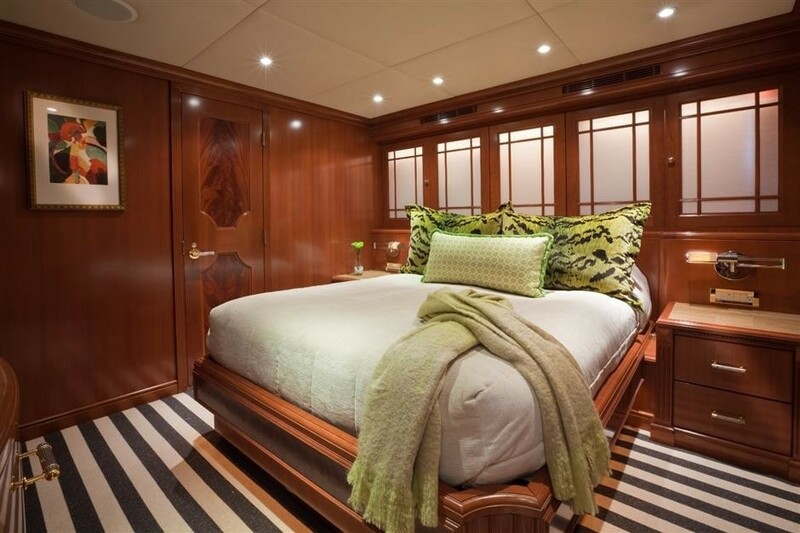 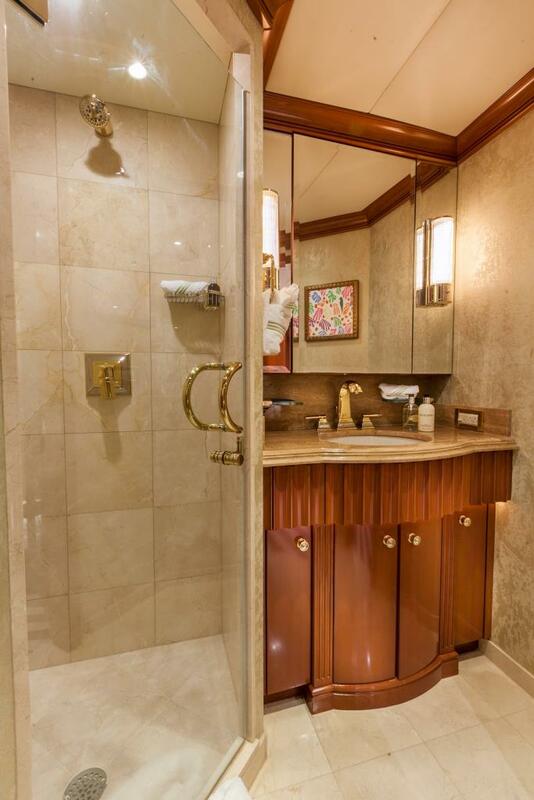 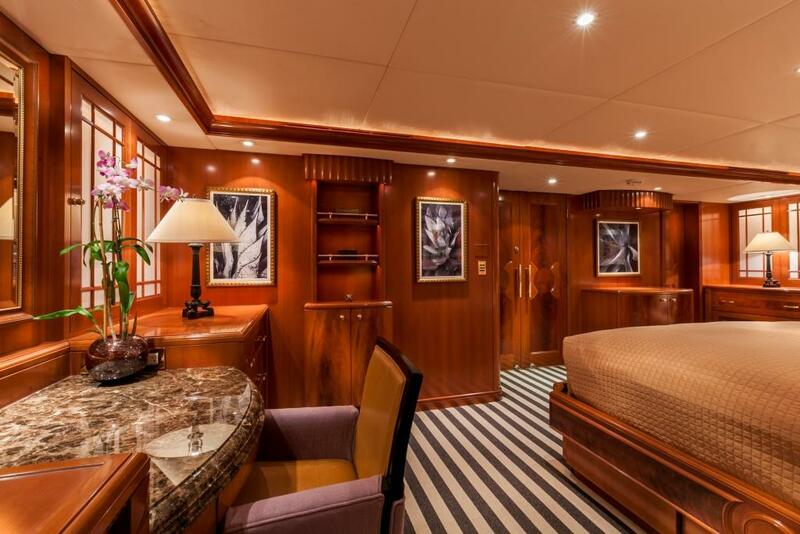 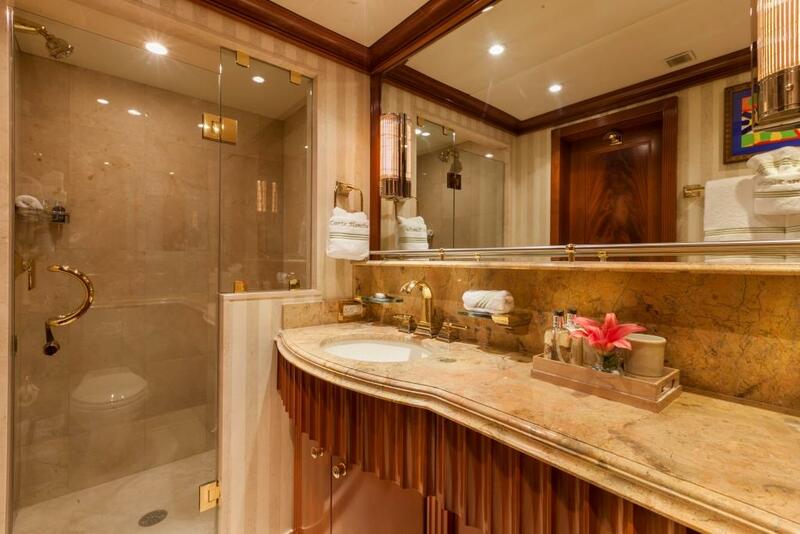 Below deck, there are four further staterooms including the master cabin which stretches full width of the beam and is introduced through beautiful Mahogany doors. 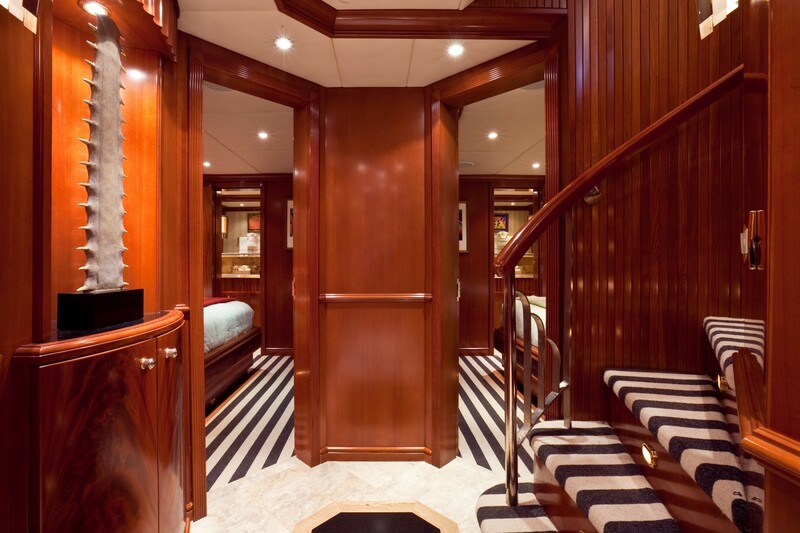 Additional features such as twin burl pillars with gold and nickel make the master cabin truly unique. 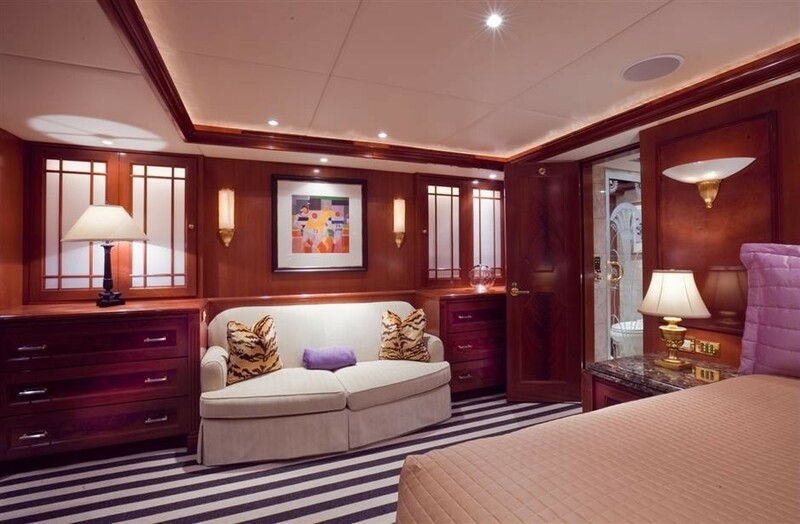 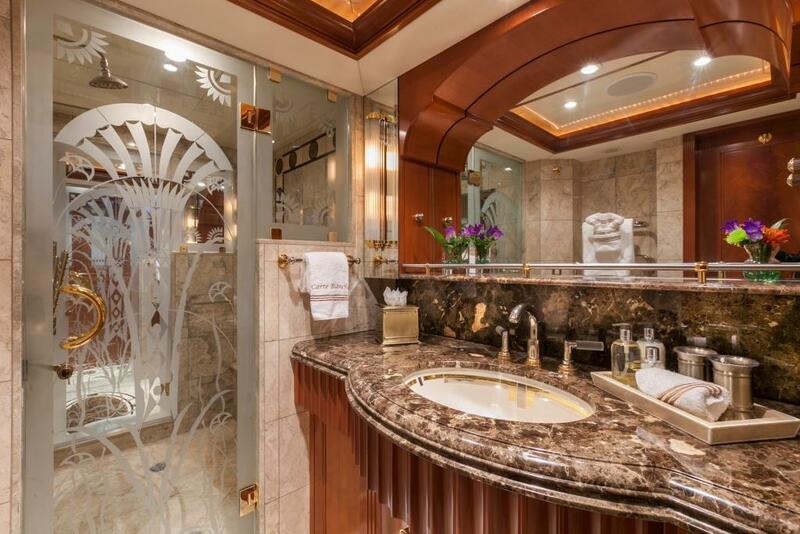 Three further guest cabins consist of two queen cabins and one twin cabin – all with private ensuites and entertainment facilities. 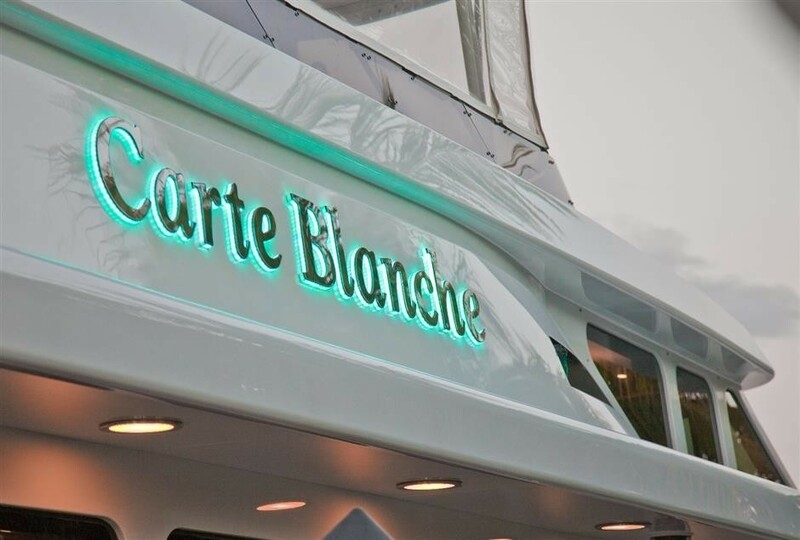 Cruising the Bahamas and Florida, guests are going to love the exterior decks spaces available on Motor yacht CARTE BLANCHE. 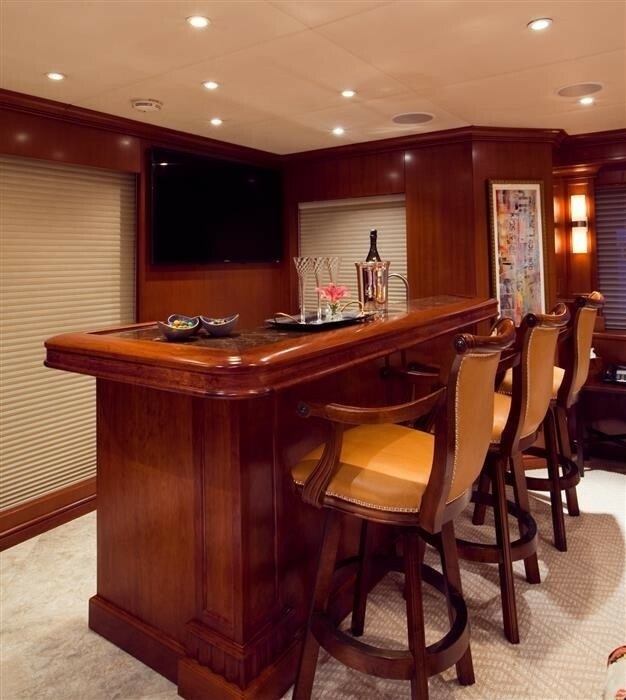 On the lower aft deck, guests can enjoy a cocktail at the bar before adjourning to the comfortable alfresco dining setting. 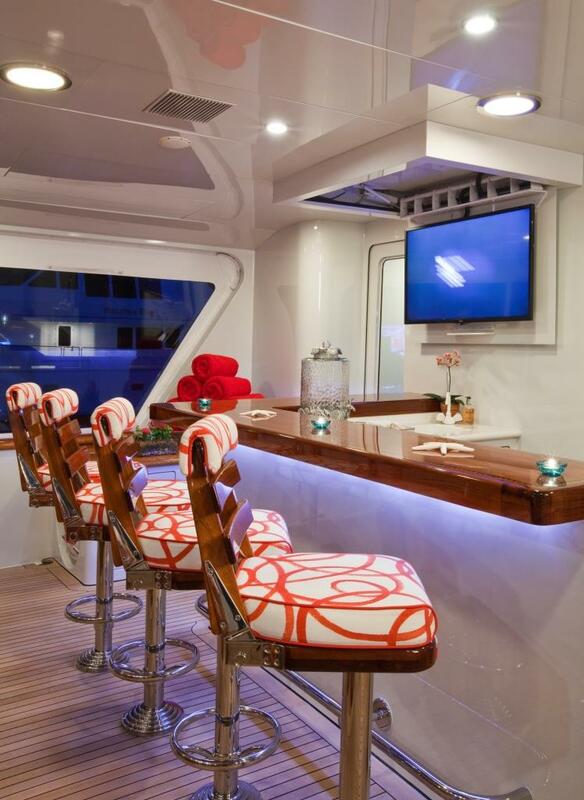 The generous flydeck also offers a wonderful space for entertaining and this is the area most guests tend to gravitate towards. 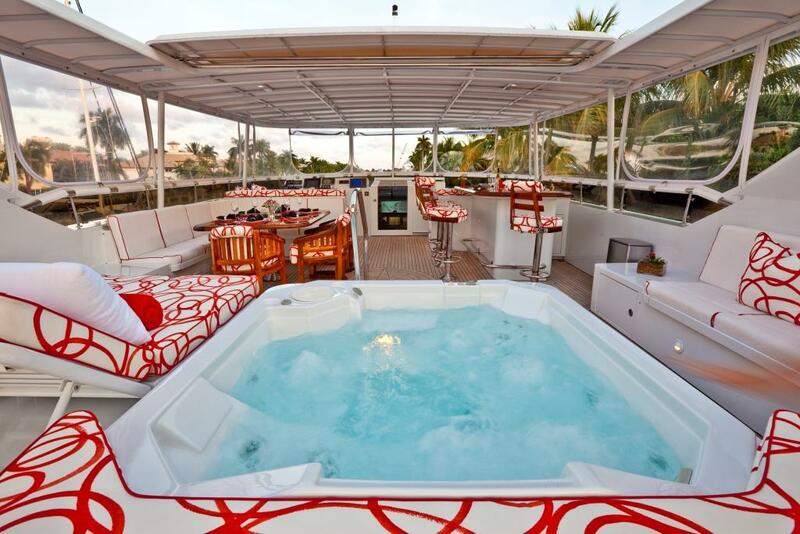 The sundeck is incredible functional. 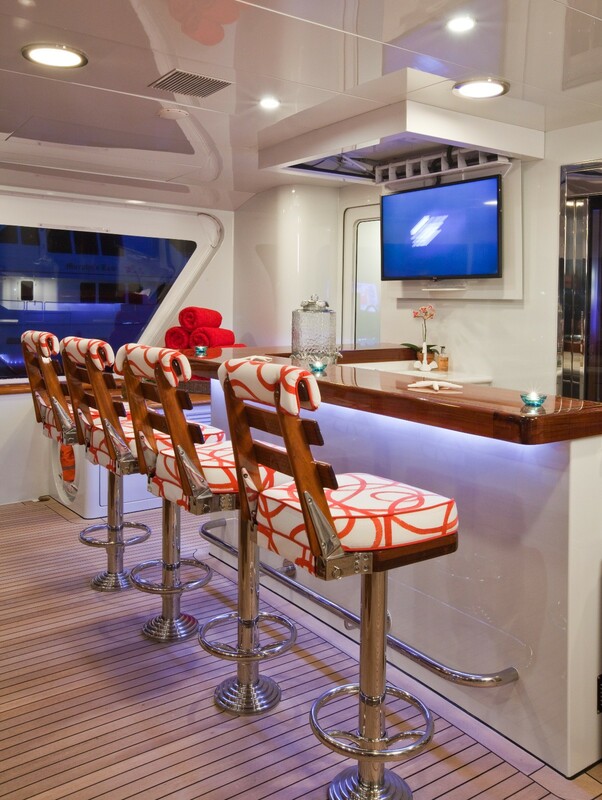 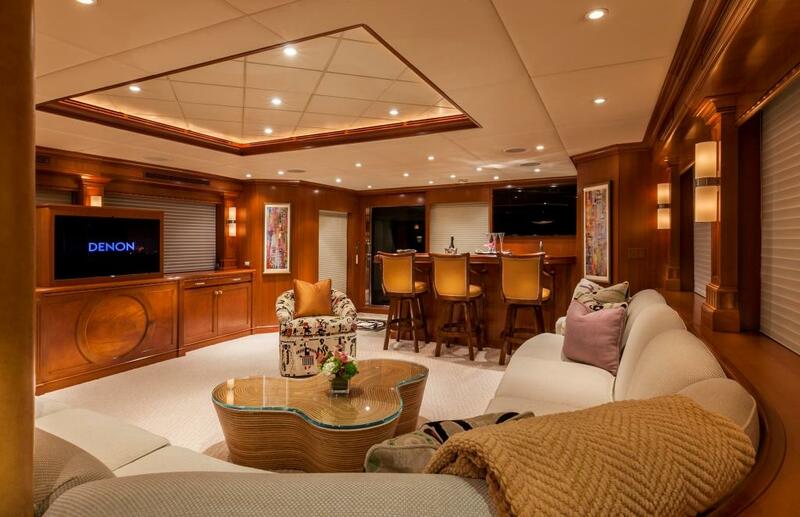 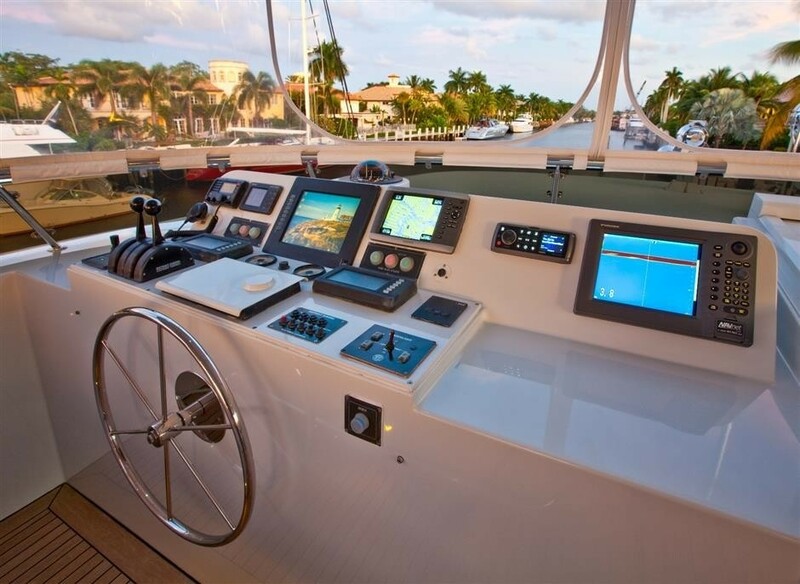 The steering station is forward and this leads back to a bar with stools and a dining area, which progresses to the deck Spa Pool surrounded by sunlounges. 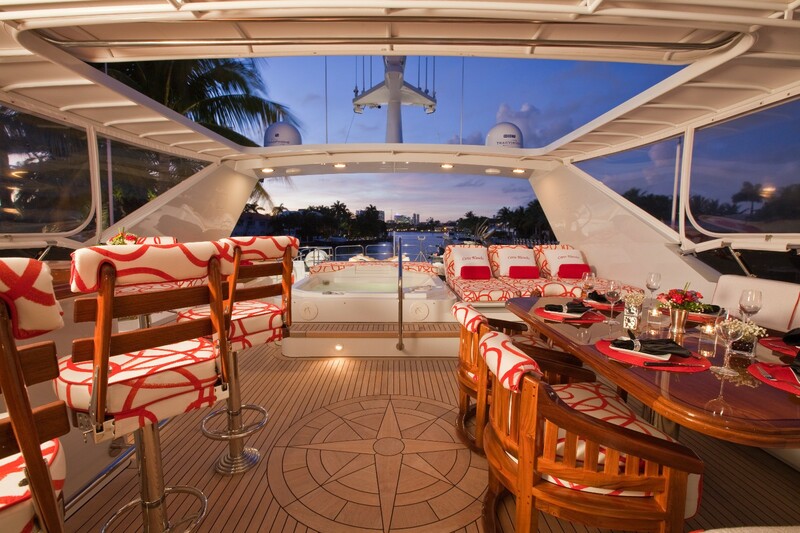 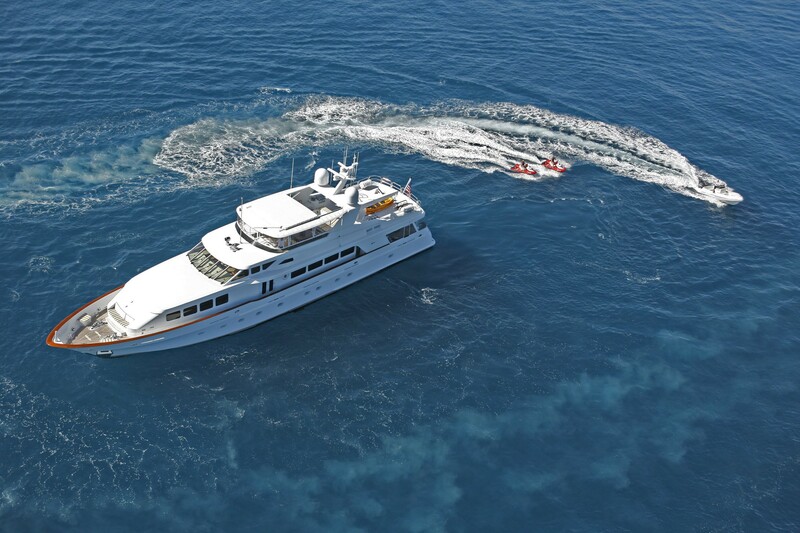 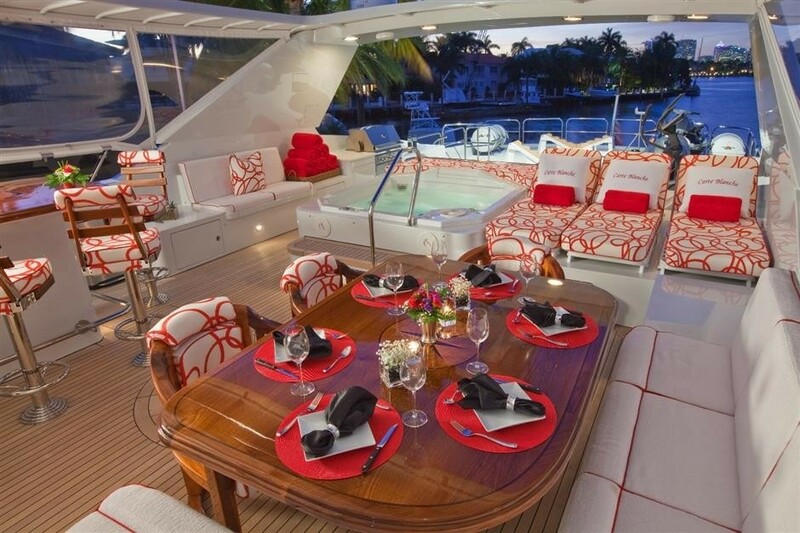 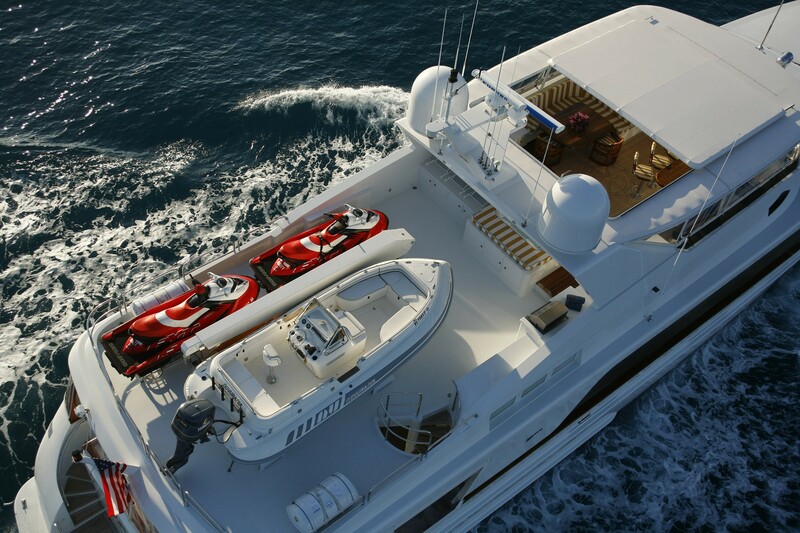 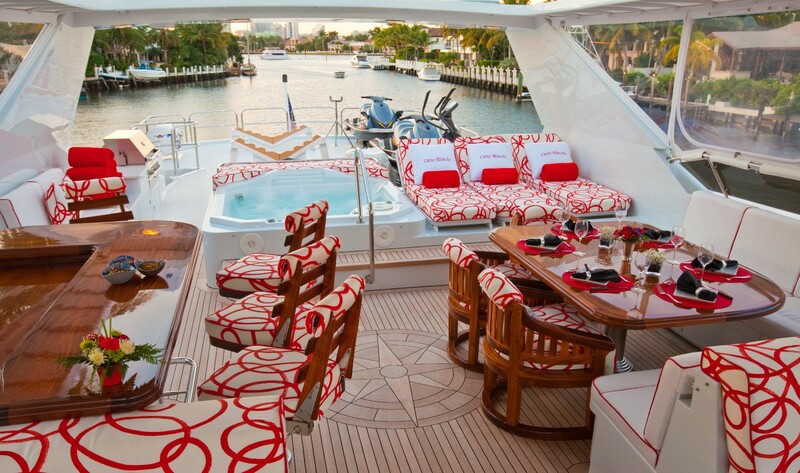 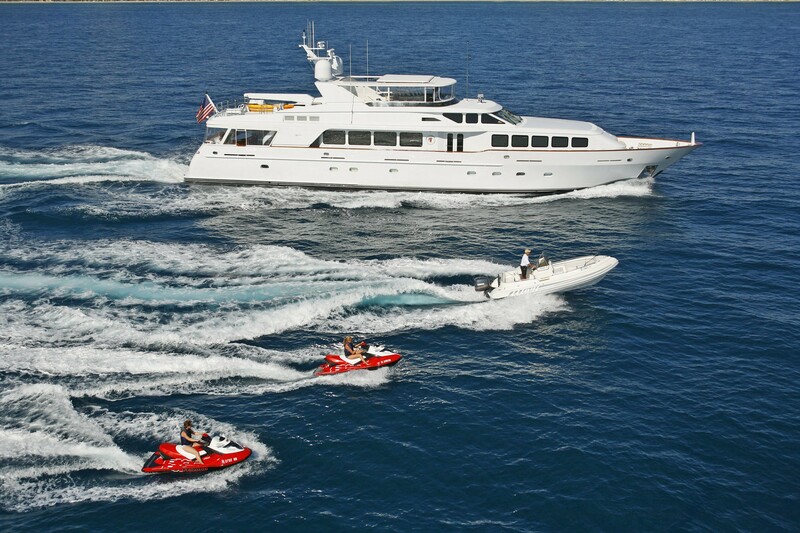 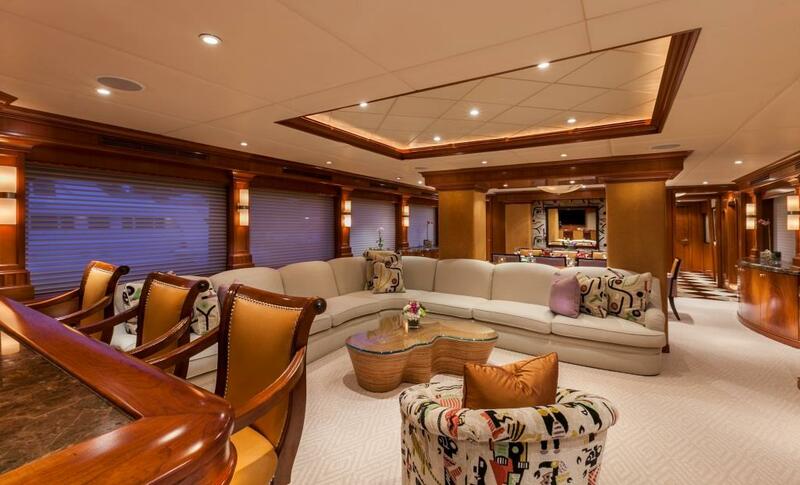 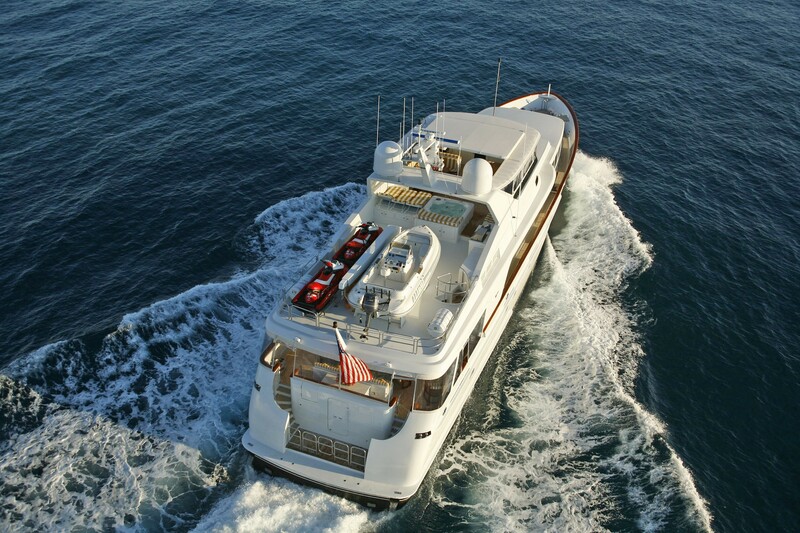 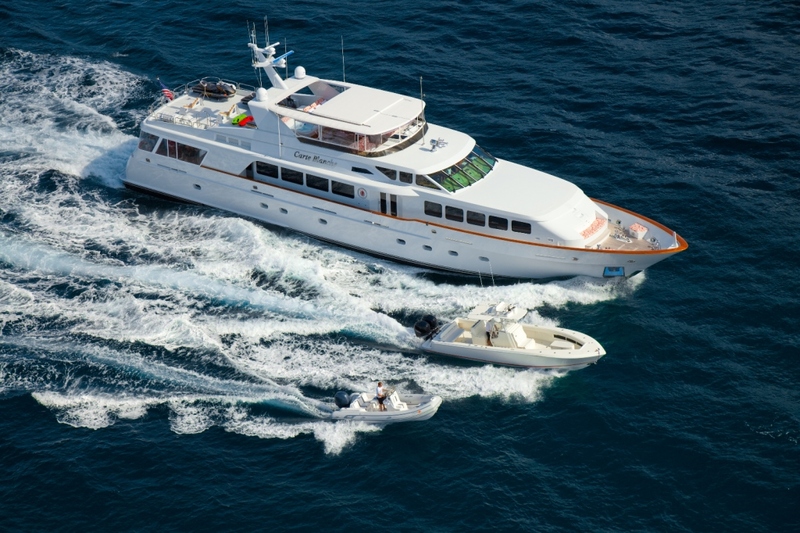 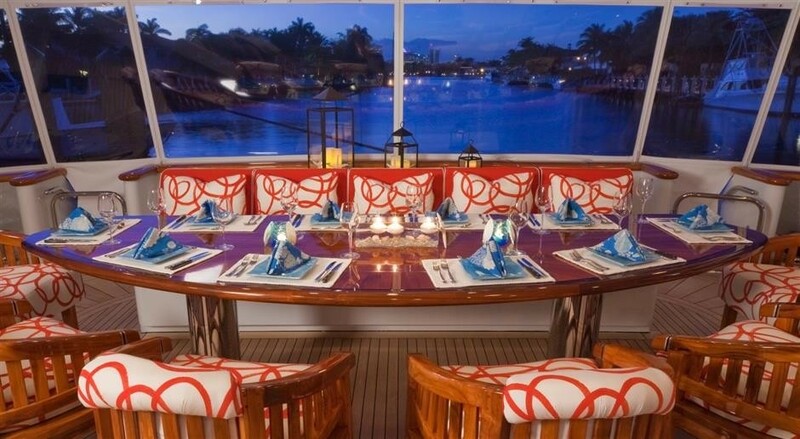 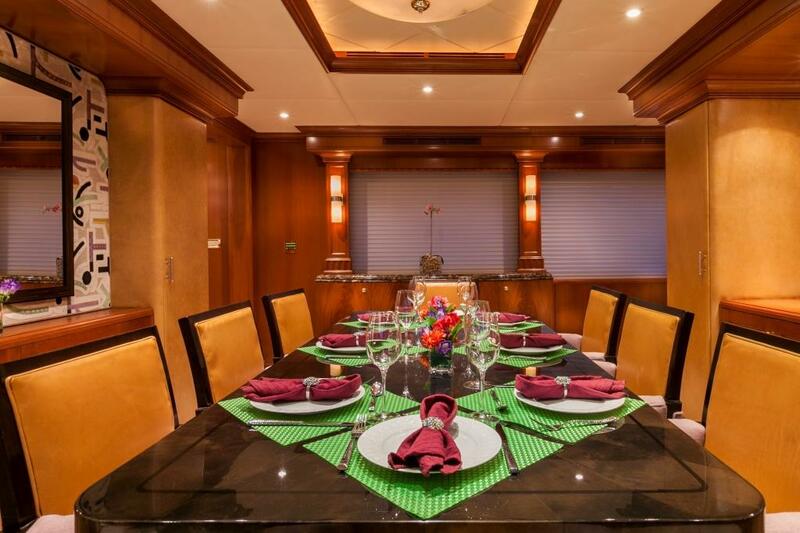 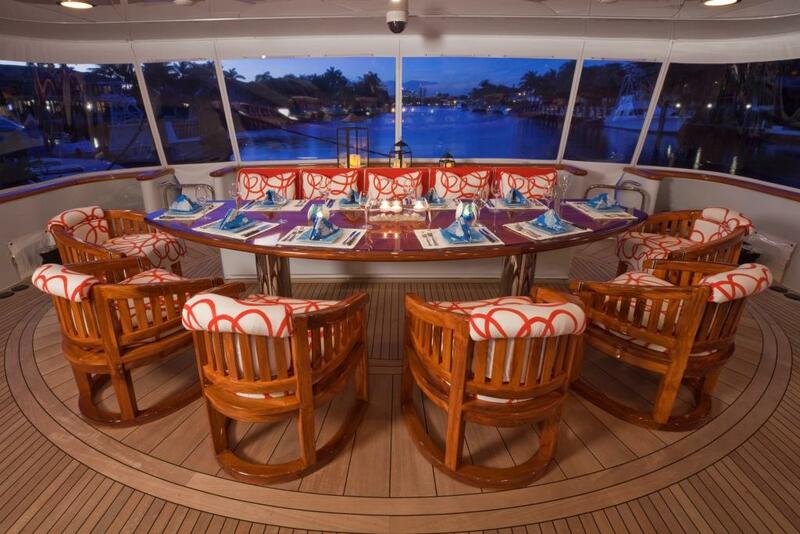 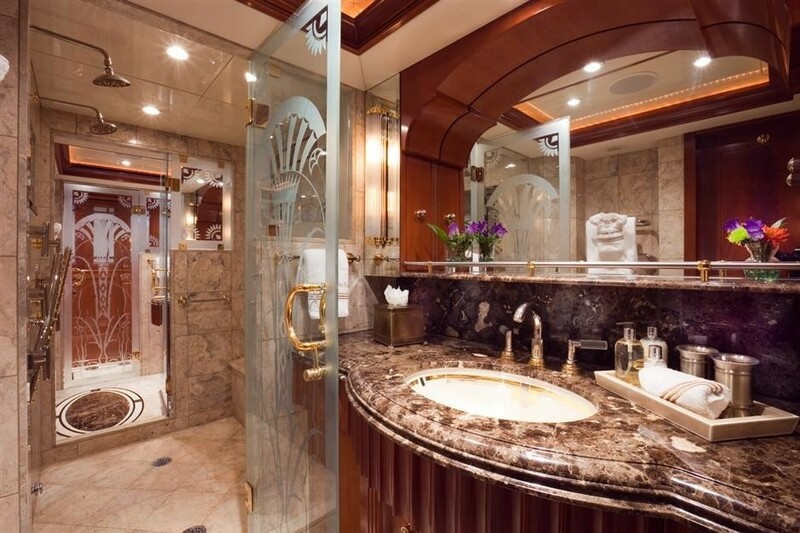 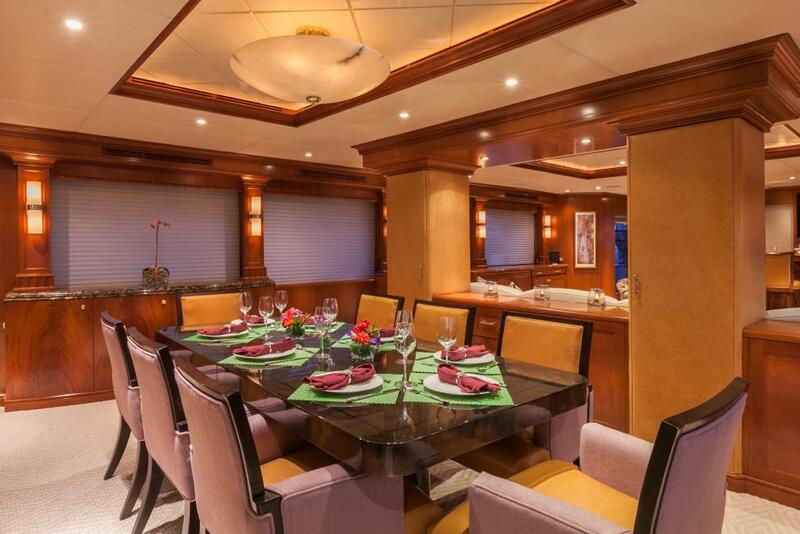 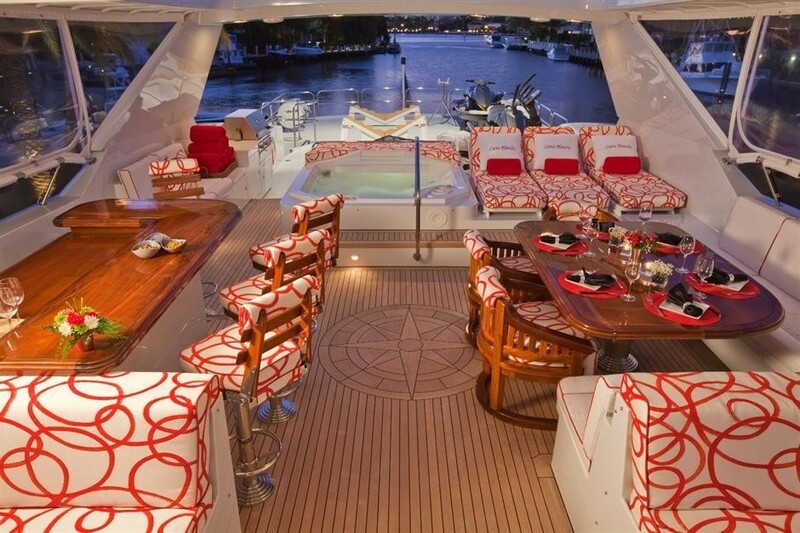 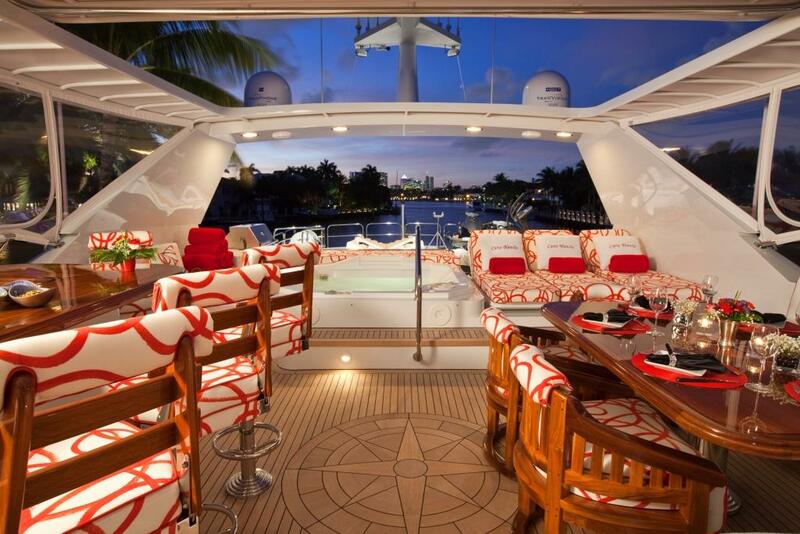 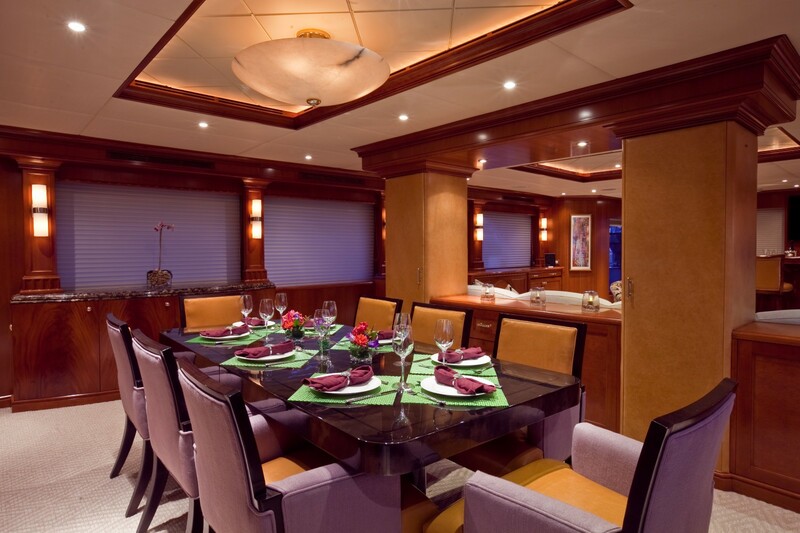 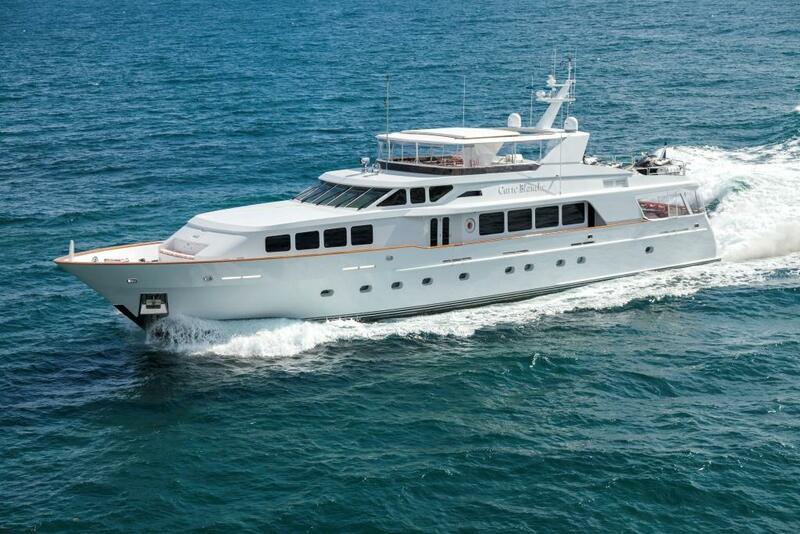 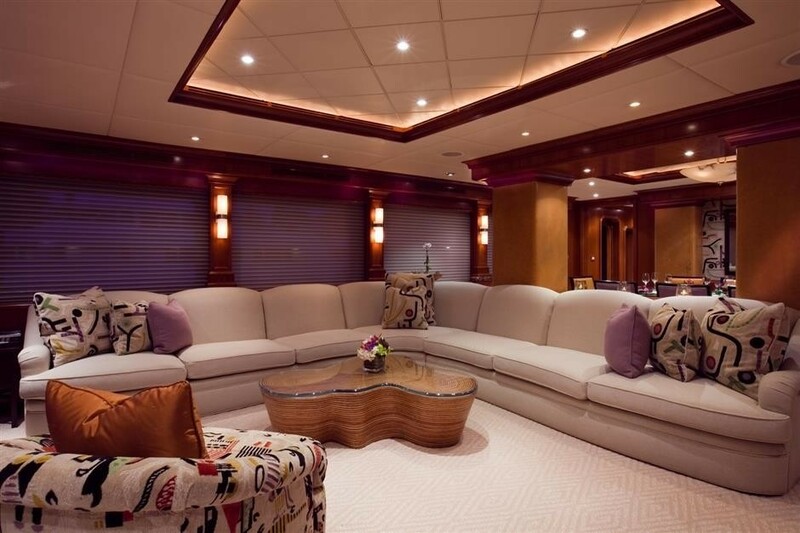 Bahamas and Florida based luxury motor yacht can accommodate up to 11 guests in 5 staterooms. 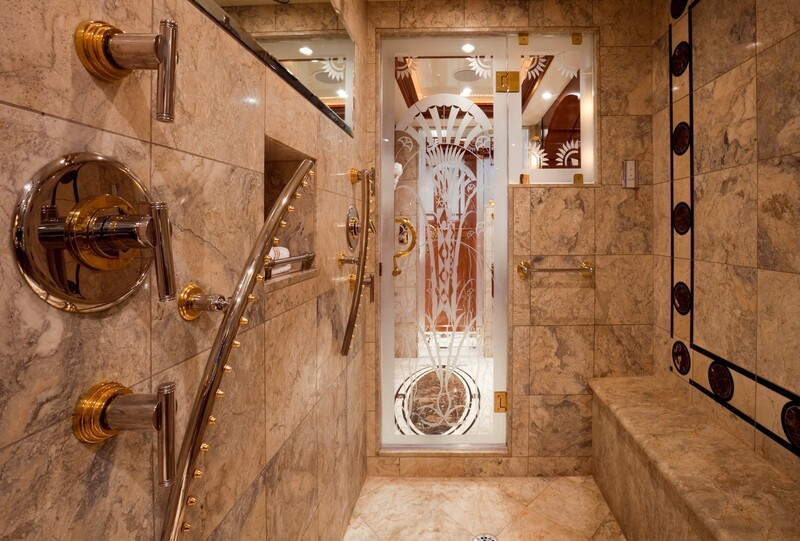 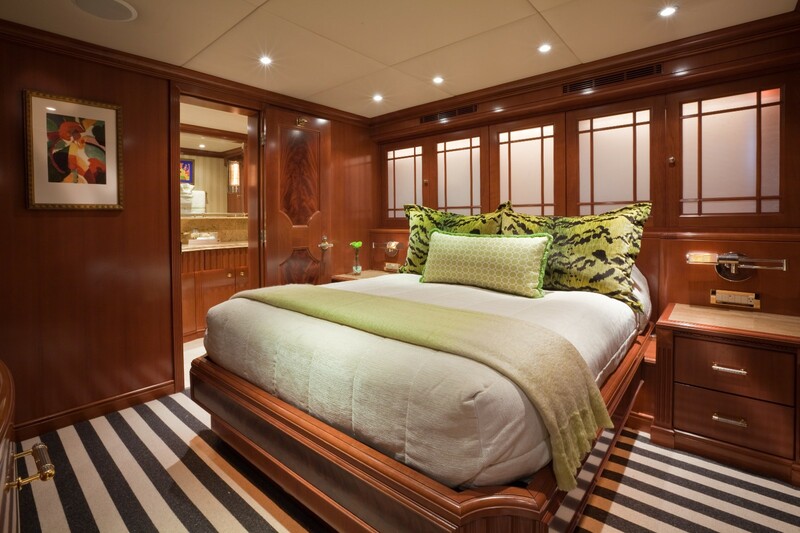 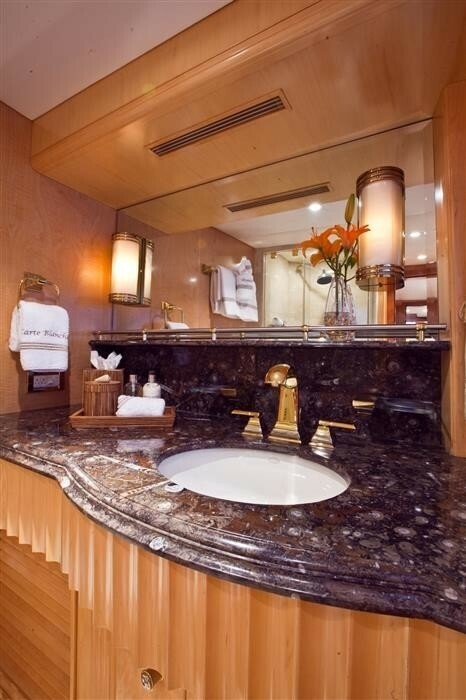 The master stateroom is located on the lower deck and stretches the full width of the beam. 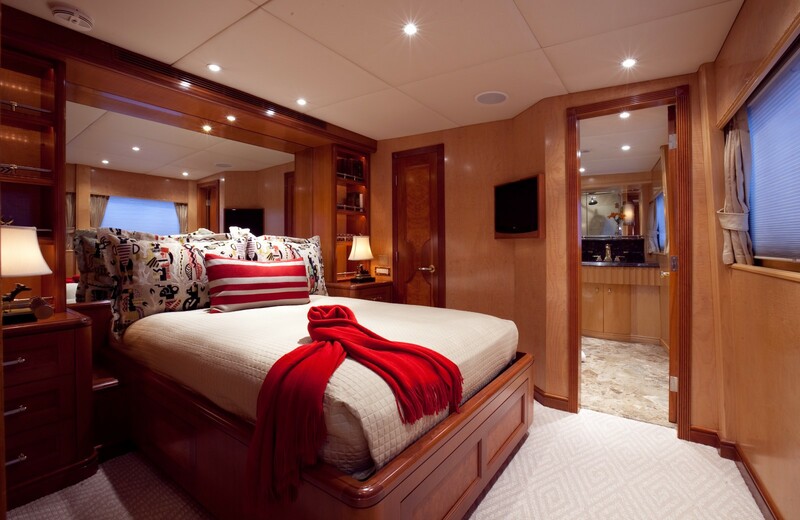 The master includes a king sized bed, a vanity table, a lounge seat and a spacious ensuite bathroom including dual custom made sinks and a fantastic jet and steam shower. 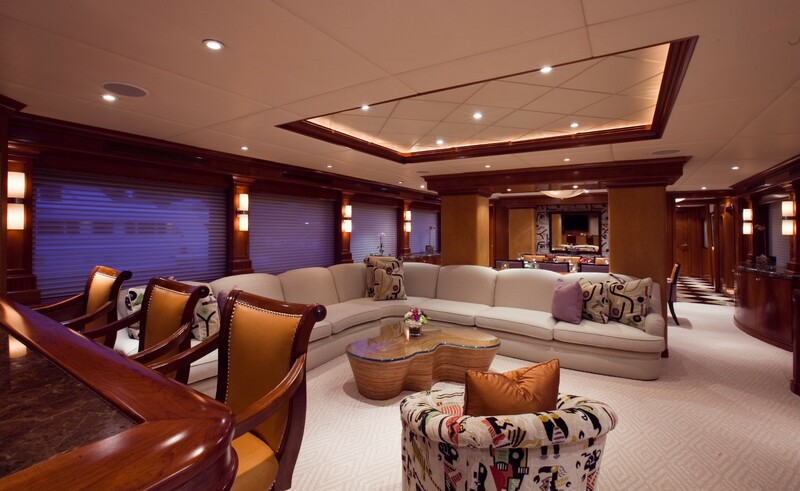 The master cabin offers full entertainment facilities including a Plasma TV, DVD, CD and capabilities for satellite reception. 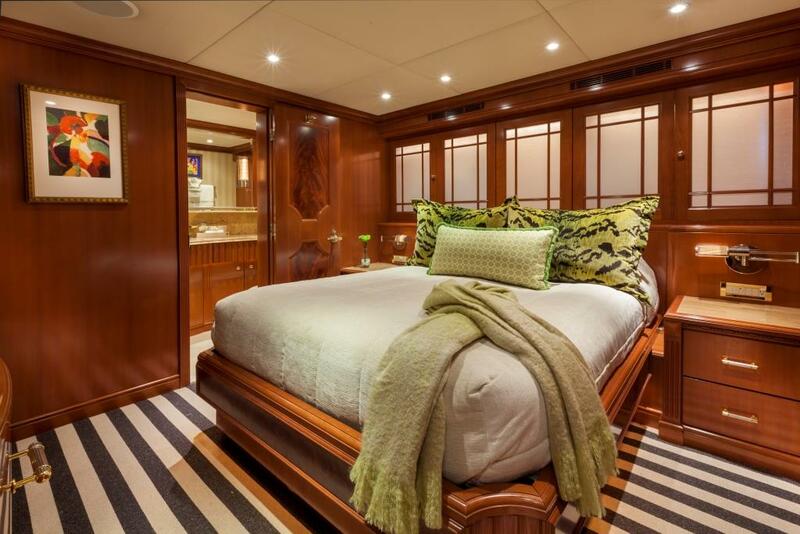 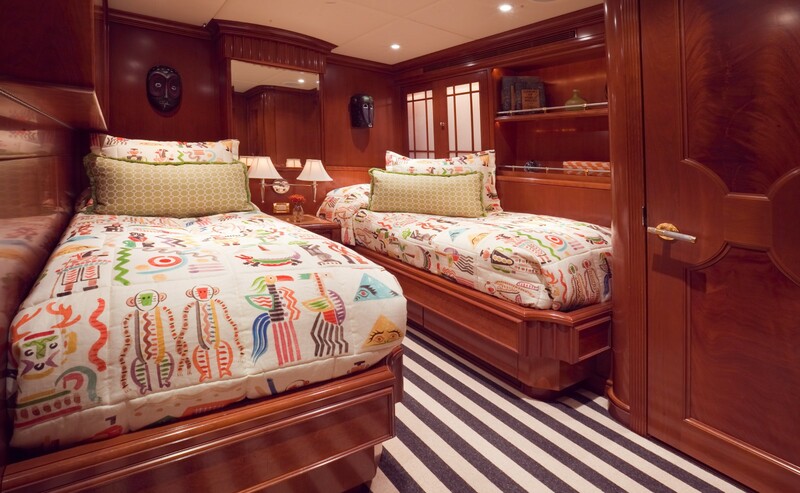 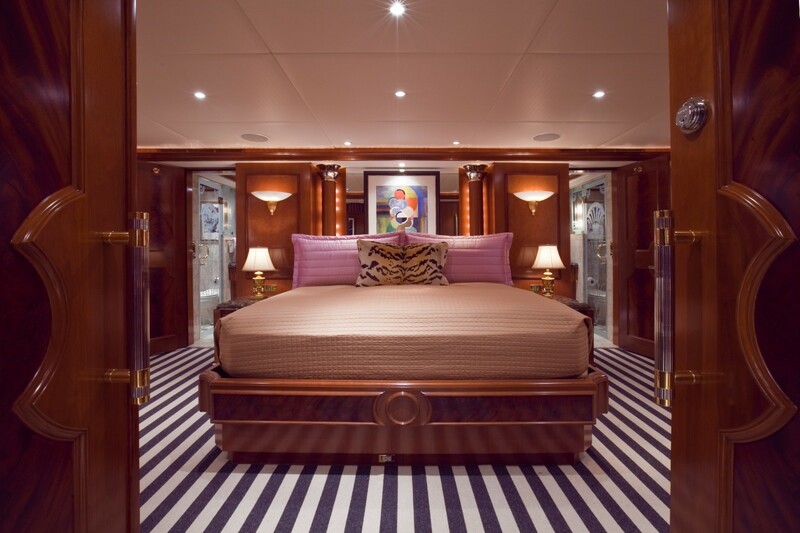 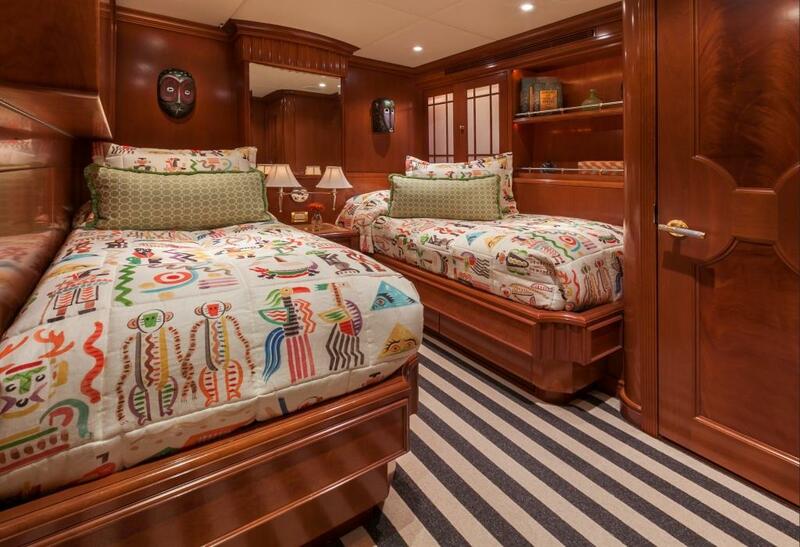 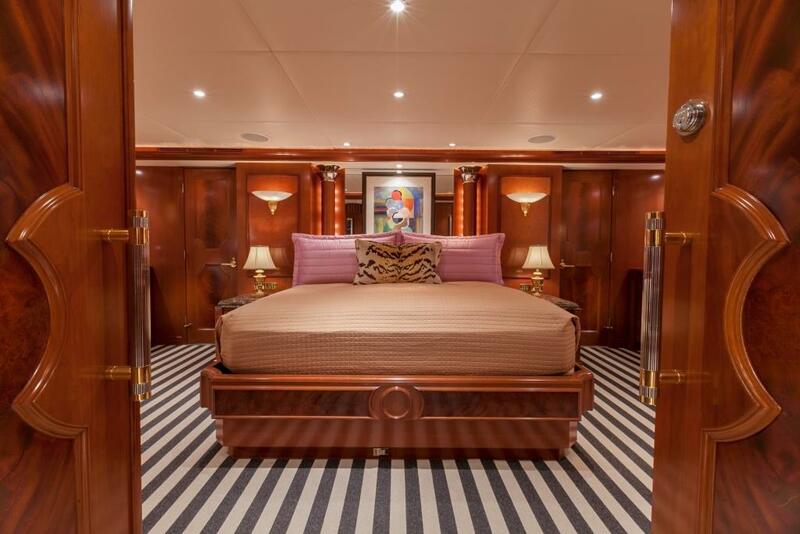 The VIP cabin is on the main deck and has a queen sized bed and a large ensuite bathroom. 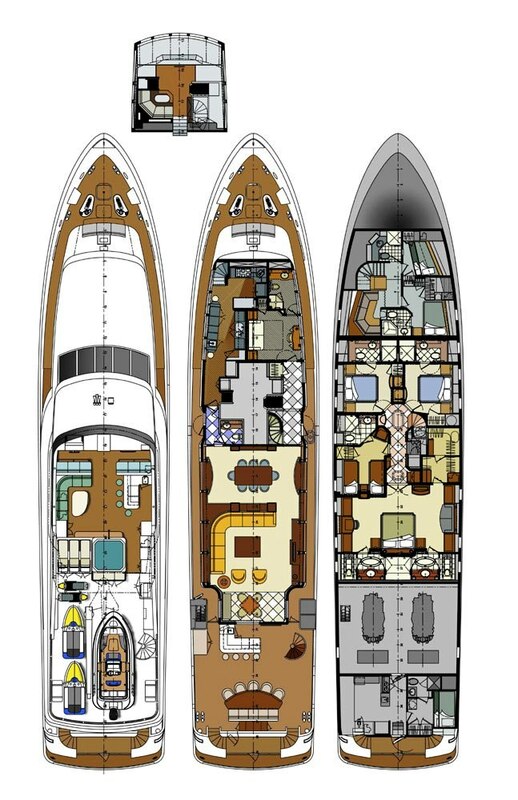 Below deck near the master cabin are two further queen cabins and one twin cabin with an extra Pullman berth. 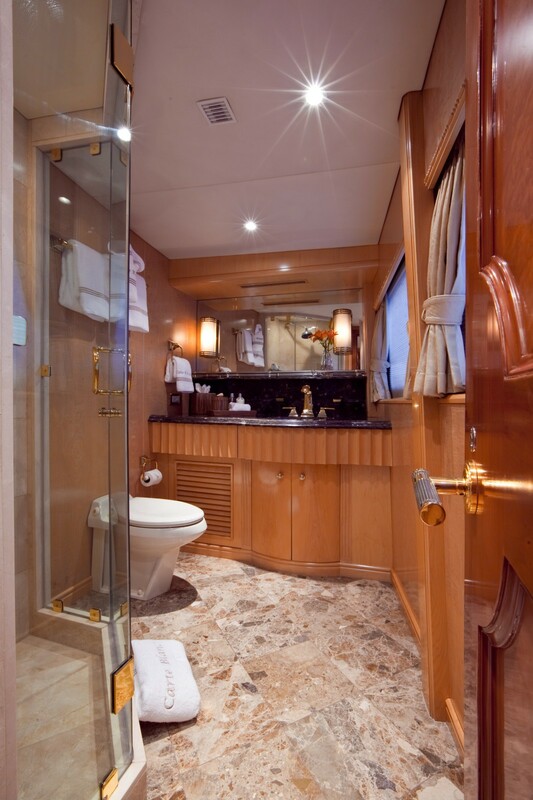 All guest cabins have ensuite bathrooms and at least basic entertainment facilities.